WASHINGTON, DC - The Annual Energy Outlook 2012 (AEO2012) Reference case released today by the U.S. Energy Information Administration (EIA) presents updated projections for U.S. energy markets through 2035. The Reference case projections include only the effects of policies that have been implemented in law or final regulations. "Our updated Reference case projections show natural gas and renewables gaining an increasing share of U.S. electric power generation, domestic crude oil and natural gas production growing, reliance on imported oil decreasing, U.S. natural gas production exceeding consumption, and energy-related carbon dioxide emissions remaining below their 2005 level through 2035," said EIA Acting Administrator Howard Gruenspecht. "These projections reflect increased energy efficiency throughout the economy, updated assessments of energy technologies and domestic energy resources, the influence of evolving consumer preferences, and projected slow economic growth," said Gruenspecht. Domestic crude oil production is expected to grow by more than 20 percent over the coming decade: Domestic crude oil production increased from 5.1 million barrels per day in 2007 to 5.5 million barrels per day in 2010. Over the next 10 years, continued development of tight oil combined with the development of offshore Gulf of Mexico resources are projected to push domestic crude oil production to 6.7 million barrels per day in 2020, a level not seen since 1994. With modest economic growth, increased efficiency, growing domestic production, and continued adoption of nonpetroleum liquids, net petroleum imports make up a smaller share of total liquids consumption: U.S. dependence on imported petroleum liquids declines in the AEO2012 Reference case, primarily as a result of growth in domestic oil production of over 1 million barrels per day by 2020, an increase in biofuel use of over 1 million barrels per day crude oil equivalent by 2024, and modest growth in transportation sector demand through 2035. 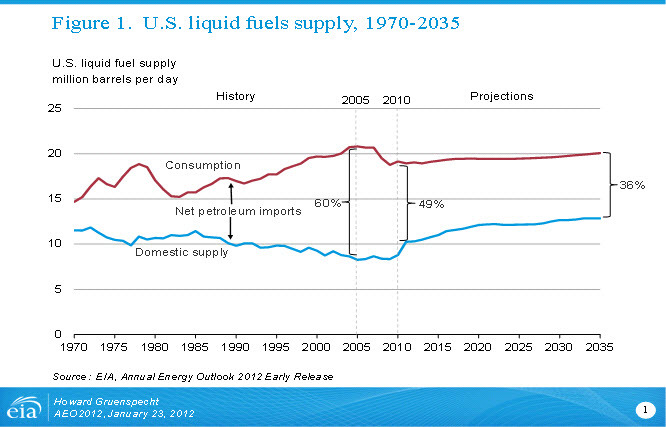 Net petroleum imports as a share of total U.S. liquid fuels consumed drop from 49 percent in 2010 to 38 percent in 2020 and 36 percent in 2035 in AEO2012 (Figure 1). U.S. production of natural gas is expected to exceed consumption early in the next decade: The United States is projected to become a net exporter of liquefied natural gas (LNG) in 2016, a net pipeline exporter in 2025, and an overall net exporter of natural gas in 2021. The outlook reflects increased use of LNG in markets outside of North America, strong domestic natural gas production, reduced pipeline imports and increased pipeline exports, and relatively low natural gas prices in the United States compared to other global markets. Use of renewable fuels and natural gas for electric power generation rises: The natural gas share of electric power generation increases from 24 percent in 2010 to 27 percent in 2035, and the renewables share grows from 10 percent to 16 percent over the same period. In recent years, the U.S. electric power sector's historical reliance on coal-fired power plants has begun to decline. 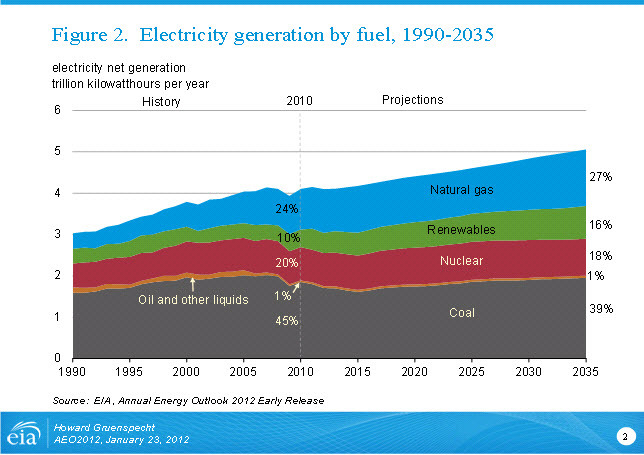 Over the next 25 years, the projected coal share of overall electricity generation falls to 39 percent, well below the 49-percent share seen as recently as 2007 (Figure 2), because of slow growth in electricity demand, continued competition from natural gas and renewable plants, and the need to comply with new environmental regulations. Total U.S. energy-related carbon dioxide (CO2) emissions remain below their 2005 level through 2035: Energy-related CO2 emissions grow by 3 percent from 2010 to 2035, reaching 5,806 million metric tons in 2035. They are more than 7 percent below their 2005 level in 2020 and do not return to the 2005 level of 5,996 million metric tons by the end of the projection period (Figure 3). Emissions per capita fall by an average of 1 percent per year from 2005 to 2035, as growth in demand for transportation fuels is moderated by higher energy prices and Federal fuel economy standards. Proposed fuel economy standards covering model years 2017 through 2025 that are not included in the Reference case would further reduce projected energy use and emissions. Electricity-related emissions are tempered by appliance and lighting efficiency standards, State renewable portfolio standard requirements, competitive natural gas prices that dampen coal use by electric generators, and implementation of the Cross-state Air Pollution Rule. World oil prices rise in the Reference case (Figure 4), as pressure from growth in global demand continues. 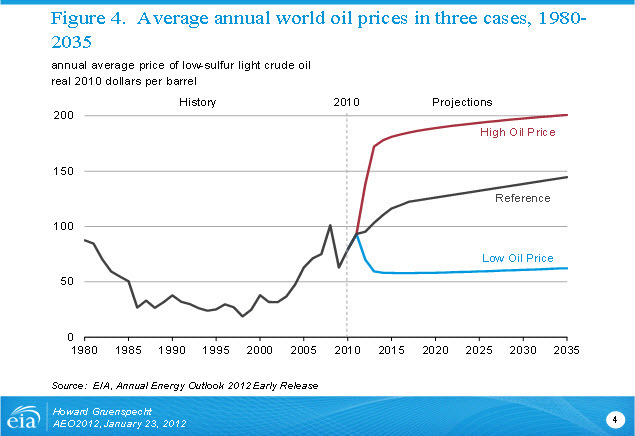 In 2035, the average real price of crude oil in the Reference case is $146 per barrel in 2010 dollars. World liquids consumption grows from 87.1 million barrels per day in 2010 to 109.7 million barrels per day in 2035, driven by growing demand in China, India, the Middle East and other developing economies. Total U.S. primary energy consumption, which was 101.4 quadrillion Btu in 2007, grows from 98.2 quadrillion Btu in 2010 to 108.0 quadrillion Btu in 2035. The fossil fuel share of energy consumption falls from 83 percent of total U.S. energy demand in 2010 to 77 percent in 2035. Net imports of energy meet a declining share of total U.S. energy demand as domestic energy production increases. The projected net import share of total U.S. energy consumption in 2035 is 13 percent, compared with 22 percent in 2010 and 29 percent in 2007. 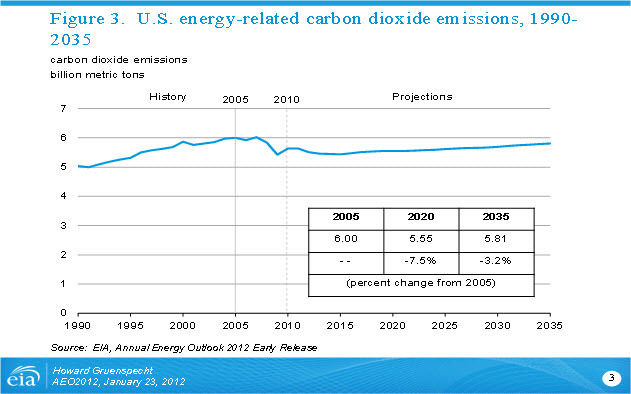 The Reference case projections from the Early Release Overview of the AEO2012 are available at http://www.eia.gov/outlooks/aeo/er/. The full AEO2012 report, including projections with differing assumptions on the price of oil, the rate of economic growth, and the characteristics of new technologies, will be released in late Spring 2012, along with regional projections.